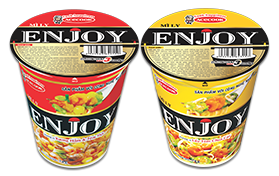 With the design of product package using the image of the God of Wealth, the company hopes to bring a Spring 2019 in the prosperity with Acecook Vietnam high-quality instant noodles to Vietnamese consumers. Customers consume the products under the promotional program in the promotional period. a) The values of Prizes I, II, II are inclusive of Value Added-Tax (VAT). b) Acecook Vietnam commits to award correct prizes as described in the Column “Prize content” and the above prize value is true based on input invoices and documentary evidences obtained by JSC Bank for Foreign Trade of Vietnam (Vietcombank) for purchasing the Company’s prizes. c) Prizes I, II will be used in JSC Bank for Foreign Trade of Vietnam (Vietcombank) within 30 days since the date of signing, in which specify names of beneficiaries. The date of signing for Prizes I, II will be the date of awarding in this regulations. Prizes I, II are not inclusive of banking fees. d) A customer is able to win many times and not limited to prize numbers. When customers purchase 01 promotional product, they have a chance to win prizes with 01 prize stamp put into such product. Customers who get the prize stamp put into promotional products are sure to get 01 cheque of VND 100,000,000 or 01 scratch card Mobifone, Viettel, Vinaphone, Vietnamobile or Gmobile of VND 100,000. – Prize III (Third Prize): 1,000 scratch cards Mobifone, Viettel, Vinaphone, Vietnamobile or Gmobile of VND 1,000,000. Only customers who are got scratch cards of Prize III and then send a message of card code to the call center in the required syntax from 07:00 on December 31st, 2018 to 19:00 on March 31st, 2019 will have a chance to receive an additional prize as 01 cheque of VND 1,000,000,000 or 01 cheque of VND 100,000,000. –Prize II (Second Prize): 16 cheques of VND 100,000,000. Acecook Vietnam will put prize stamp s into promotional products in Acecook factories in the witness of representatives of Department of Industry & Trade, leaders of Acecook Vietnam, and then distribute prizes in the country as from 07:00 on December 31st, 2018. • For scratch cards of Prize III: Notes of retaining scratch cards of Prize III (phone card of VND 1,000,000) for participation in lucky number turning. c. The lists of winning codes, control codes are registered with Vietnam Trade promotion Agency – Ministry of Industry & Trade. d. Total number of winning stamps issued are: 1,004 stamps corresponding to 1,004 promotional products, in which there are 04 winning stamps of Prize II (Second Prize) and 1,000 winning stamps of Prize III (Third Prize). o Winners of Second Prize (Prize II): Customers who are got winning stamps in promotional products will win 01 cheque of VND 100,000,000. Winning stamps indicate the prizes that customers will receive them. Customers scratch in “SCRATCHING PART” to appear the line: “A CHEQUE OF VND 100,000,000”. o Winners of Third Prize (Prize III): Customers who get winning stamps put into promotional products are sure to get 01 scratch card Mobifone, Viettel, Vinaphone, Vietnamobile or Gmobile of VND 100,000,000. Winning stamps indicate the prizes that customers will receive them. Customers scratch in “SCRATCHING PART” to appear the line: “01 SCRATCH CARD OF VND 1,000,000 WITH WINNING CODE OF: XXXXXXXXX”, in which XXXXXXXXX is the winning code of 09 characters. Customers use the prize code to send a message in the specified syntax to the call center of the program to receive the prize and join in the program of number turning. o Customers fail to win the prizes without winning stamps in the promotional products. 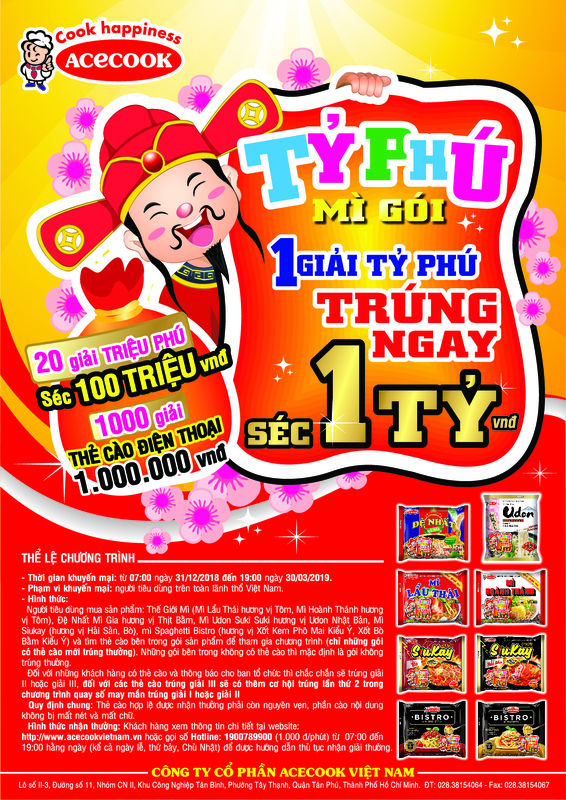 – For prizes from turning lucky numbers: Customers who was won Third Prize (Prize III) and sent a winning code to the call center in the required syntax and in the specified time will be participated in turning lucky numbers for prize determination and have a chance to receive an additional prize of 01 cheque of VND 1,000,000,000 or 01 cheque of VND 100,000,000, it is recommended to retain the winning stamps to collate the characters of winning code and the result of lucky number turning. With each winning stamp, customers will have a chance to win an additional cheque of VND 1,000,000,000 or 01 cheques of VND 100,000,000. Method of lucky number turning: Winning codes of Prize III from scratching stamps will be summarized into a digital software. 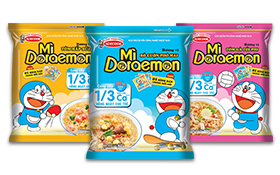 A representative of Acecook Vietnam will randomly press in the software to select winners. Participants in the supervision of lucky number turning: The representative of Department of Industry & Trade where makes lucky number turning, the representative of B.C.I BRANDCARE CO., LTD and the representative of consumers. Location of lucky number turning: The Office of Acecook Vietnam, Lot No. II-3, Street No.11, Industry II Group, Tan Binh Industrial Park, Tay Thanh Ward, Tan Phu District, Ho Chi Minh City. 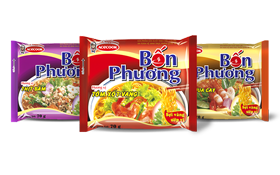 As soon as the turning results are received, Acecook Vietnam will declare the winning results and directly notify to winners via phone numbers which customers have used to get scratch cards before. The qualified customers in the series of number turning will have the right to continue the next series in case of no winning until completion of 2nd time. – For Third Prize (III): Winners of Third Prize (III) notice the winning by sending a message of scratch card code to the call center in the required syntax from 07:00 on December 31st, 2018 to 19:00 on March 31st, 2019. – For winners of Second Prize (II) from the scratching program for winning determination: Customers notice the winning by calling the hot line 1900789900 from December 31st, 2018 to March 31st, 2019, then within 05 days since customers notice the winning, the call center of the program will contact (calling, sending a message) to notify the winning for winners in order to make an appointment of awarding in the location of JSC Bank for Foreign Trade of Vietnam (Vietcombank) as agreed by two parties closest to where customers live/work. – For winners of Second Prize (II) from the program for lucky number turning: Within 05 days since the result of turning is obtained, the call center of the program will contact (calling, sending a message) to notify the winning for winners in order to make an appointment of awarding in the location of JSC Bank for Foreign Trade of Vietnam (Vietcombank) as agreed by two parties closest to where customers live/work. – For winners of First Prize (I) from the program for lucky number turning: Within 05 days since the result of turning is obtained, the call center of the program will contact (calling, sending a message) to notify the winning for winners in order to make an appointment of awarding in Ho Chi Minh City. – Acecook Vietnam will sponsor traveling expenses to receive the prizes for winners of First Prize (I), Second Prize (II) (if any). o To use the prize of phone package, customers send a message with the syntax “ACECOOKTYPHU [blank] <prize code>” send 8079 (500 dong/01 message). o Customers who send the message with correct syntax will receive a feedback: “Congratulation! You have an additional chance to participate in the program of lucky number turning with the prize including 01 cheque of VND 1,000,000,000 or 01 cheques of VND 100,000,000. Please to retain the winning scratch card so that the call center could contact to notify the information of award, the prize would be directly delivered to your subscriber.” Immediately, customers will be received a respective prize value in their subscriber (applicable to both prepaid and post-paid subscribers). o After customers are received the prize value in their subscriber (applicable to both prepaid and post-paid subscribers), they will get an additional message: “You’ve received VND 1,000,000 in this subscriber. This your phone number is confirmed to join in the program of lucky number turning with the prize including 01 cheque of VND 1,000,000,000 or 01 cheques of VND 100,000,000. Please retain the winning stamp and keep the contact to get the winning information (if lucky)”. o If sending a correct winning code or syntax, customers will receive a feedback in your subscriber with the following content: “The syntax you have sent is incorrect, please repeat again in the required syntax: ““ACECOOKTYPHU [blank] <prize code>” send 8079”. o In case of expiration of winning information receipt but customers send the message to get the prize, they will get a feedback to their subscriber with the content: “Sorry! The time of sending a message to the call center is ended at 19:00 on March 31st, 2019, thank you for your support to the program”. o Customers are received the prize only when scratching the winning stamp and sending a message to the call center in the required syntax from 07:00 on December 31st, 2018 – 19:00 on March 31st, 2019. In case of broken stamp or no prize code seen (due to customers’ fault in scratching), customers are not got the prize. After the said time, all winning stamps that are not scratched and sent the prize code in the specified syntax will be invalid. o Determining total prize value without winners of scratch cards is the basis to pay the cash into the national budget based on the summary report of paid amount to customers in the said syntax during the promotional time. The summary report which is confirmed by Acecook Vie Nam and Elcomplus., JSC (the unit in charge of number head 8079) is also the basis to determine the list of customers joining in the program of number turning for each number turning series hereunder. ♣ Customers no more retain original winning stamp for collation. o Prizes will be considered as having no winners. The Organization Board will determine prize numbers with no winners to pay into the national budget in the current law. o The final time at which winners receive prizes is 45 (forty-five) days since the end date of the promotional program. Customers’ irregular personal income tax from winning in this promotional program will be paid by Acecook Vietnam to the competent authority (if any). For all questions involving this promotional program, customers contact in hotline 1900789900 for instructions, answers (1,000 dong/min). The call center 1900789900 starts from 7:00 to 19:00 each day (including holidays, Saturday, Sunday) from December 31st, 2018 to May 14th, 2019. – Acecook Vietnam notices on the promotional program on the website https://www.acecookvietnam.vn, newspapers and at all promotional product agents, distributors as defined in item 2 of this regulations in the whole country. The details of the promotional program are printed in the product package. – Acecook Vietnam is responsible for noticing the results to winners and publishing on the website https://www.acecookvietnam.vn. 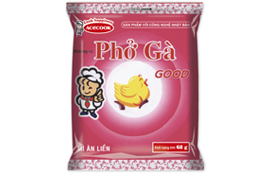 – Acecook Vietnam is absolutely responsible for managing putting evidences of winning determination into the promotional program and their accuracy. – The organization of promotional program should be made sure of fairness, transparency, objectiveness. If winners agree, Acecook Vietnam will use their name and image for commercial advertising. 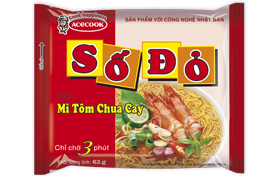 – In case of a dispute involving this promotional program, Acecook Vietnam is responsible for direct settlement, if the negotiation is failed, the dispute will be resolved in the law. 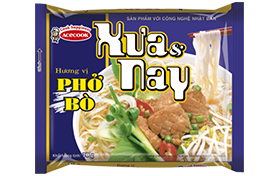 – For prizes with no winners, Acecook Vietnam is liable for paying the cash of 50% the declared value of such prizes into the national budget in the regulation at clause 4 article 96 the Commercial Law.